The calendar tells us Spring is just around the corner and, while that normally means warmer weather and the end of winter, this year at Walt Disney World, it means a lot more! Spring is heating up in Orlando with lots of new events, experiences, and entertainment options for guests at the most magical place on Earth. The annual Epcot Flower and Garden Show is sure to delight visitors of all ages. The incredible character topiaries and interactive playgrounds will amaze the kids while adults can take advantage of 13 different outdoor kitchens offering seasonal food and drinks. Every weekend through the end of the Flower and Garden Show, the blooms will be rocking as Epcot welcomes special musical guests like the Gin Blossoms, Night Ranger and the Village People for the Garden Rocks Concert series included with your park admission. 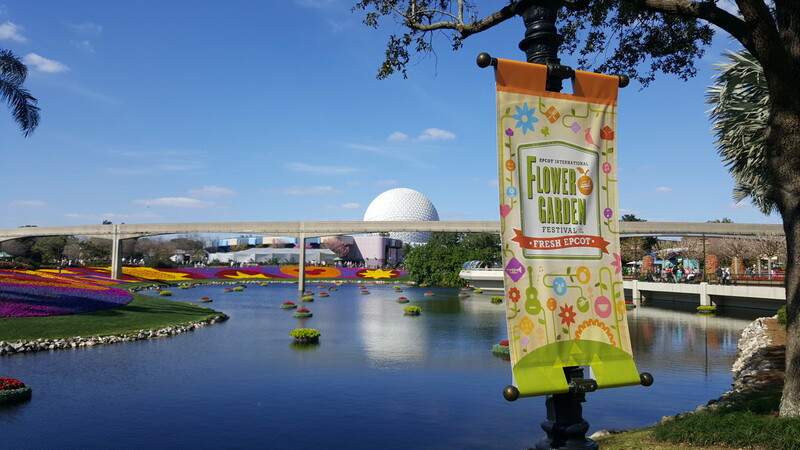 The Epcot Flower and Garden Show runs through May 30th, you can see a walk through of menus and food booths here. After you’ve taken in the sights of Epcot, you can enjoy the newest nighttime offering at Walt Disney World, River of Lights at Animal Kingdom. Opening on April 22nd, this long awaited show takes place on Discovery River between Discovery Island and Expedition Everest. When the show begins, two mystical storytellers come to the river to summon animal spirits. Riding elaborate lantern vessels, the storytellers will wake the animals through a dramatic dance of water and light. The Tree of Life will also be part of the show with magical fireflies transforming Animal Kingdom’s iconic tree into a glowing beacon of wonder and enchantment. From the brief glimpses we have had into River of Lights, this is sure to be an amazing experience. A new sunset version of the popular Kilimanjaro Safari ride will also begin wowing guests on April 22nd. While details are limited, the ride is expected to give visitors a glimpse of life on the savanna like we have never seen before at Animal Kingdom! Hollywood Studios is also offering up exciting new experiences for visitors from a galaxy far, far away! Beginning on April 4th, the new live Star Wars entertainment experience Star Wars: A Galaxy Far, Far Away will take place on the several times each day on the Center State in front of the Chinese Theater. According to sources, the show will “play out iconic moments from the film saga … and will feature appearances from Star Wars characters like Kylo Ren, Chewbacca, Darth Vader and Darth Maul.” The March of the First Order Stormtrooper procession led by Captain Phasma will also thrill fans starting April 4th. This event features Captain Phasma, from Star Wars The Force Awakens, leading a platoon of First Order Stormtroopers on a march from the park’s Star Wars Launch Bay to Center Stage several times each day. These new Star Wars offerings at Hollywood Studios will join existing experiences and rides like Star Tours — The Adventures Continue and Jedi Training: Trials of the Temple. Visitors to Hollywood Studios will also have the chance to meet familiar characters like Chewbacca and Kylo Ren for photos and autographs, if you dare ask for one! The Star Wars character meet and greets are located in the Star Wars Launch Bay, which also offers an up-close look at replica props, models and costumes from the movies. A Spring day at Hollywood Studios filled with Star Wars adventure can be capped off with the nightly Star Wars themed fireworks show Symphony in the Stars: A Galactic Spectacular. If all the adventures at Hollywood Studios wore you out, you might want to take a break from the parks and check out all the new options at Disney Springs. The area formerly known as Downtown Disney is scheduled to begin opening in phases beginning May 15th. The dining and shopping district will feature four distinct neighborhoods to explore and, all told, will feature more than 150 different stores and restaurants. Restaurants scheduled to open soon include The Edison, an “industrial gothic”-style restaurant with themed areas and a performance space, celebrity Chef Rick Bayless‘ Frontera Fresca featuring authentic Mexican cuisine, and Homecoming: Florida Kitchen and Southern Shine, a farm to table restaurant highlighting the sunshine state’s cuisine. New stores on tap for Disney Springs include Lilly Pulitzer, Pandora, Tommy Bahama, and Zara. And don’t forget, if you are staying at a Disney resort, your purchases in Disney Springs can be sent directly to your hotel! Another exciting event happening this Spring will bring athletes from around the world to Walt Disney World! The Invictus Games will take place at ESPN Wide World of Sports May 8 – 12. The event brings together wounded servicemen and women from around the world and allows them to compete against one another in a variety of sporting events. In it’s inaugural year in London in 2014, the event had more than 400 athletes and 65,000 fans. This year’s games will be the first time the event has taken place in the United States and is expected to draw similar numbers. Prince Harry is the leading sponsor of the Invictus Games and he has said the event uses the power of sports to inspire recovery, support rehabilitation and generate a wider understanding and respect for those who serve their country. It should be a very inspiring week! Plus, there’s still time to save on a vacation to Walt Disney World this Spring! The spring room promotion is still available and can cut up to 25% off your room rate at select Walt Disney World hotels on stays through June 11th. If you want to be part of the exciting Spring events at Walt Disney World, contact jamie@mickeytravels.com to start planning your vacation today. As a lifelong Disney fan, Jamie has found a way to turn her obsession into a career. As an Authorized Disney Vacation Planner with MickeyTravels, Jamie loves helping people experience the magic of Disney, whether it is their first time or their 40th.She resides in Michigan with her family, but escapes to Disney destinations every chance she gets.